0 Comments Published by KL Ocs Kid on Monday, August 13, 2007 at 9:06 AM. Dirk Kuyt reckons that him and Torres are at the start of a beautiful relationship after yesterday’s opening Premiership victory over Aston Villa. In news that Peter Crouch may find hard to take, Dirk was bigging up Torres and himself as the main Liverpool strike force. “I thought that Fernando played well. 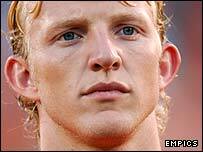 We had some good chances and we looked good together,” said Kuyt. “The first goal was an own goal but the team work between the two of us leading up to it was really good. “Now we will just try to work on things and keep going in the right direction. “It’s his first time in the Premier League but I don’t think he will need too long a time to adjust. Every player needs a few games when they come in but he has shown already some quality.